The additional exercises are practised as a training aid to develop physical strength, stamina, speed and muscle coordination. 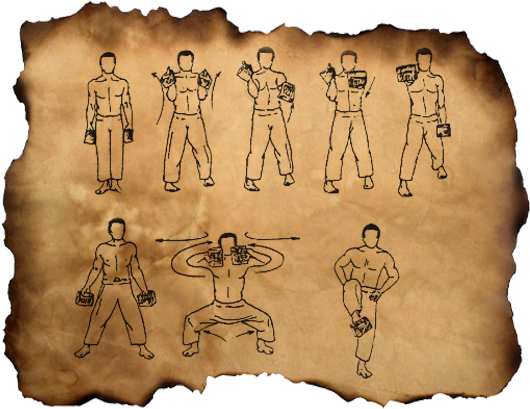 The exercises are very useful for basic training. If students understand the principles behind each exercise and practice them methodically, they will greatly improve their body movement and capacity. It is important to do these exercises regularly over a long period of time and then you will discover that your physical fitness has improved greatly. These exercises can help you overcome a dip in your physical condition. The development of physical strength requires time and students should not expect instant results. I would like to highlight some of the more important issues when doing additional exercises with training aids: 1. Before starting to train, make sure the material is in good condition. 2. Look after the material carefully since it will help you develop your technique and capacity. 3. When you use the material, make sure you do not get in anyone else’s way, since some of the material can be dangerous. If you practice in front of the mirror, make sure you do so at a safe distance from it. 4. After training, make sure you put the material away correctly. If you see that part of the material has not been put away correctly, put it back in its place. 5. It is important to know your physical condition and design an exercise programme based on it and in accordance with your requirements. 6. When you use the oval iron (kongoken), which is very heavy, it is best to practice with the help of other students. 7. It is very important to know the limits of your physical strength. Choose the material that is right for you. You should not start with equipment that is too heavy for you. Make sure you start with material that you find easy to manage and then move on to heavy materials when you feel at ease with it. 8. If you are right-handed, make sure you do two or three times more repetitions with your left hand. 9. Maintain the correct posture while using the equipment. Lift the material from the floor carefully, making sure you bend your knees. Using the equipment in an incorrect posture can cause back and hip injuries. To lift the material, lower your hips and then raise them together with the equipment, holding it firmly with your hands. 10. 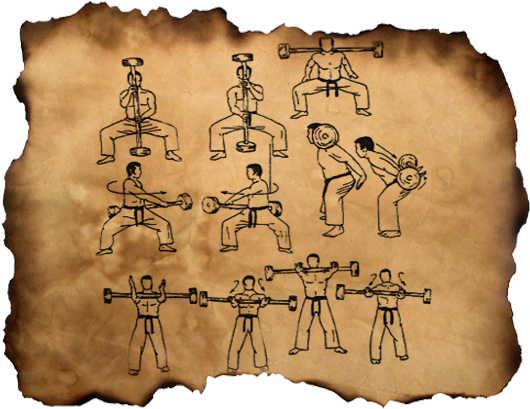 Always remember that everyday objects can also be used as training aids to develop your strength. Holding the nigiri-game helps you develop a firm grip. Lifting the nigiri-game towards the front and sides strengthens your shoulders and wrists. Lifting the nigiri-game towards the back helps develop your forearm muscles and improve your posture. Extend your toes and maintain your soles and toes firmly in contact with the floor as if they were stuck to it (like the roots of a willow spreading below the soil). Turn your knees inwards and tighten your thigh muscles. Training with the nigiri-game develops your stability, as well as strong hips, legs and feet. Training with the nigiri-game strengthens the internal organs using the deep-breathing system. It also helps develop a strong lower abdomen area. First of all, use an empty nigiri-game for training purposes. After a certain time, make it gradually heavier and heavier by adding sand. Add more sand as your physical strength improves. After you have developed a certain grip strength, use a nigiri-game with a straight nozzle. After you have even more gripping power, coat the nozzles of the jars with oil to make them more slippery. In order to increase your grip strength for the nigiri-game, practice holding tennis balls or small pebbles. 3-Makiwara (Hitting post) Hitting the makiwara is one of the most basic exercises in karate. You can hit the makiwara using the seiken zuki, the shatei zuki or the hiji uchi. Hitting the makiwara hardens the first knuckles and the back and heel of the hand. It also strengthens the wrist. The makiwara can also be hit with your feet to develop your kicking power. 4-Kongoken (Oval metal weight) The kongoken weighs at least 30-40 kg. Therefore, it is best to train with a colleague when using it. 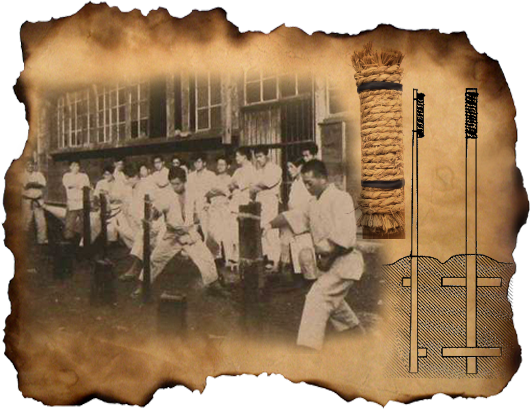 The exercises with the kongoken are effective for developing a strong body and more powerful throwing and grip techniques. 5-Ishisashi (Stone padlock) The ishiashi is used to develop and strengthen the forearm muscles, the upper arm muscles and the wrists. Exercising with the ishiashi also makes your hands stronger and improves your pulling techniques. 6-Tan (Bar with weights) Exercising with the tan strengthens your upper arm muscles, forearms and lower extremities. It also helps strengthen your wrists, hips and neck. 7-Tou (Bundle of cane or bamboo sticks) Use a bundle of cane or thin bamboo sticks tied together at both ends with a piece of straw. Attack the bundle of canes with a nukite. The exercise strengthens your fingertips. You can also get hold of a piece of cane or bamboo after you have attacked the bundle and then try and put it towards you. 8-Jari-bako (Box of sand) Fill a box with beans, gravel or sand and then hit it with your fingers. Repeat the exercise 200 times with each hand every day to harden your fingertips and strengthen your finger joints. This exercise also adds power to knife hand attacks. 9-Tetsu-geta (Iron clogs) Exercises with iron clogs, which consist of walking and raising your legs, strengthen your leg muscles, abdomen and back. These exercises also make your kicks more powerful. 10-Sashi-ishi (Weights with natural stones) Exercising with the sashi-ishi strengthen the hips, wrists, hand attack power and kicking power. 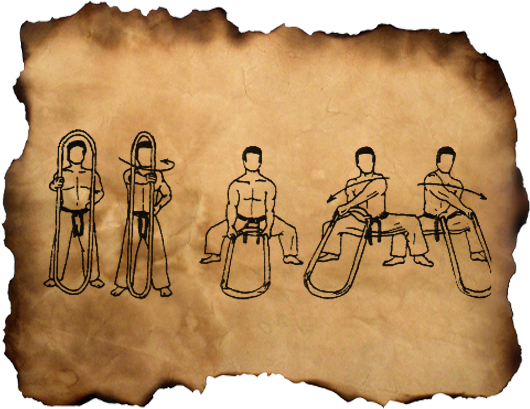 Exercising with the sashi-ishi also develops the muchimi (hitting hand) and the intensity of your movements. 11-Makiage-kigu (Wrist roller) The makiage kigu is used mainly to strengthen your grip and wrists. Exercising with the makiage kigu also develops the forearms. 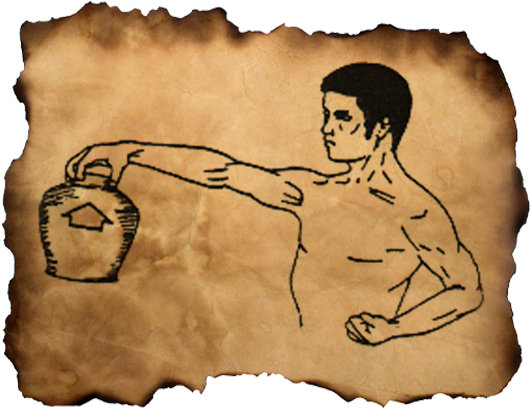 12-Tetsuarei (Weights) Training with tetsuarei develops the strength of your hand attacks and your upper arm muscles, forearms, neck, chest, back and lower extremities. Exercising with tetsuarei helps develop power for basic techniques. 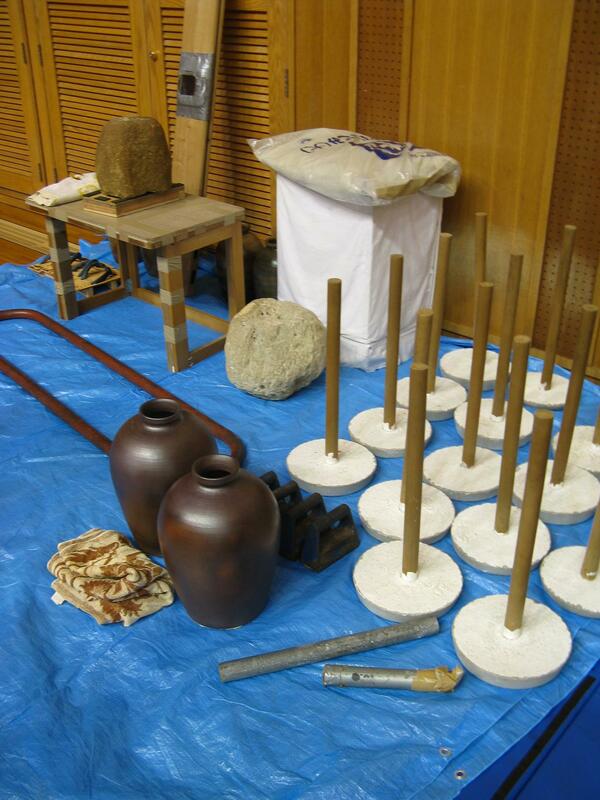 13-Temochi-shiki makiwara (Portable makiwara) In its place, the pao (hitting cushion) can be used. The positive aspects of this type of training include being able to attack with your hands and feet from different angles and distances. It also helps improve the power of your punches, kicks and attacks with the elbow and knee. 14-Round makiwara This is the same as a normal makiwara, but its round shape is used to harden the arms and palms of the hand, strengthening blocks and pushes.